Cooperative food systems are based in cooperation, encourage inclusion, reconnect farmers and consumers, champion the local, and support more environmentally sustainable food systems. This exploratory research proposes a new economic framework for strategizing how to strengthen cooperative food systems. 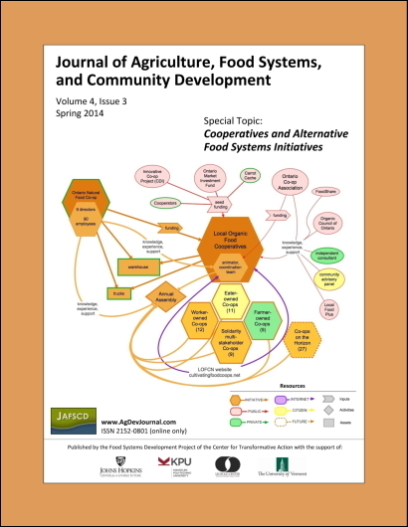 It also presents the example of a cooperative food system emerging in Ontario, Canada, the Local Organic Food Co-ops (LOFC) Network, to illustrate how to use the framework, drawing on the experience of the third author, who is the animator of the Network. Applying this analytical tool to the LOFC shows that the sixth cooperative principle — cooperation among cooperatives — is crucial for the viability of the Network, along with alliances and education. It also highlights the strength of horizontal linkages and the importance of leadership. Adult Education and Community Development Program; OISE, University of Toronto; 252 Bloor Street West; Toronto, Ontario M5S 1V6 Canada. Business and Society Program, York University; S712 Ross Building, 4700 Keele Street; Toronto, Ontario M3J 1P3 Canada. Local Organic Food Co-ops Network, c/o Ontario Natural Food Co-op; 5685 McLaughlin Road; Mississauga, Ontario L5R 3K5 Canada.